This recipe is inspired by the Just Egg product everyone’s been talking about. I was so excited to see an egg product that looked (and supposedly tasted) like the real thing! The only thing I didn’t love was the addition of canola oil, which some health experts believe to be highly processed and inflammatory in the body. So, I wanted to take a swing at my own version and am pretty excited about the results. The base of this 9-ingredient recipe is soaked split mung beans, a.k.a. moong dal. It’s a soft legume that’s easy to digest and happens to be the color of scrambled eggs (for the win). Once soaked, it’s blended with light coconut milk for added fat (which I discovered helped things like my Buckwheat Crepes bind well without sticking to the pan). For color and flavor I added turmeric, nutritional yeast, onion powder, and black salt, a.k.a. kala namak. It’s a special seasoning that has a magical eggy flavor. It’s crazy how much it really does taste like eggs! If you don’t have black salt either order it or just use whatever salt you have on hand. It’s not absolutely essential. Rice flour helps thicken and give body and texture to the “eggs.” And oil adds a little bit more fat for pliability. Once blended it’s time to cook! 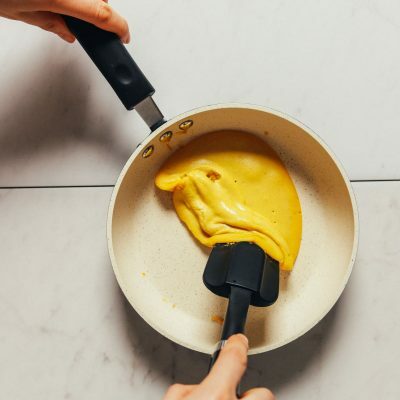 I found the best method for cooking these “eggs” is in a non-stick pan (we like this one as a healthier alternative to Teflon). But you can use a well-oiled cast iron in a pinch. Heat over medium-low, add just enough of the mixture to coat the pan, then cover and cook for a couple minutes. The edges should appear dry, which means it’s time to push them around with a soft spatula. Cover and cook for 1-2 minutes more for a soft scramble or up to 4-5 minutes (flipping occasionally) for a firm scramble. These would make the perfect thing to have on hand for easy scrambles throughout the week. Or, use as a base for things like quiche, frittatas, omelets, and more! Oh the eggy possibilities. If you’re into breakfast scrambles, also be sure to check out our Southwest Tofu Scramble, Masala-Spiced Tofu Scramble, Sweet Potato Kale Hash, and Fluffy Chickpea Scramble. 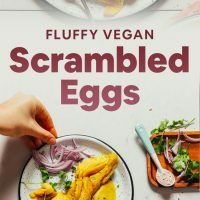 Fluffy vegan eggs made with mung beans! A delicious egg alternative made with 9 real, wholesome ingredients. Perfect for scrambles, omelets, frittatas, and more! Rinse mung beans and add to a large mixing bowl. Cover with lukewarm water and soak (covered) for at least 6 hours or overnight. Drain and rinse well, then add to a high-speed blender. Add remaining ingredients and blend until creamy and smooth. 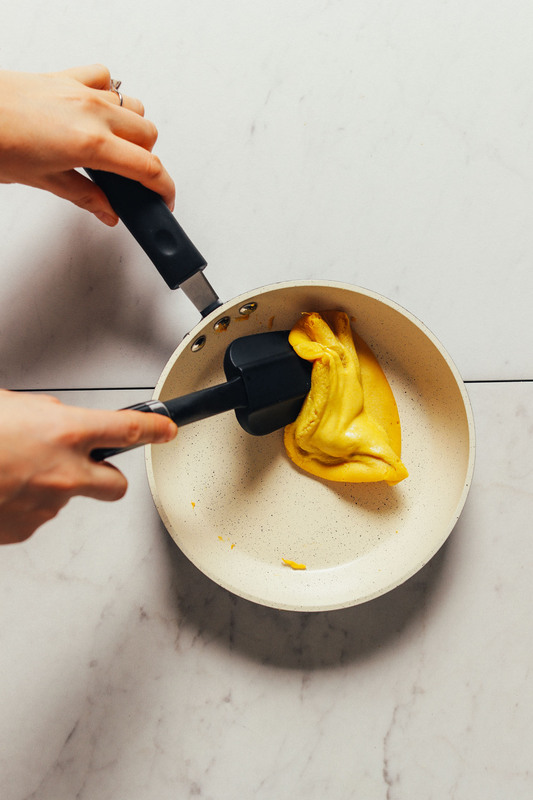 Taste and adjust flavor as needed, adding more black salt for “eggy” flavor, onion powder for overall flavor, turmeric for color, or nutritional yeast for cheesy flavor. The batter should be thin and pourable, but not too watery. Add more rice flour if too thin or more coconut milk if too thick. 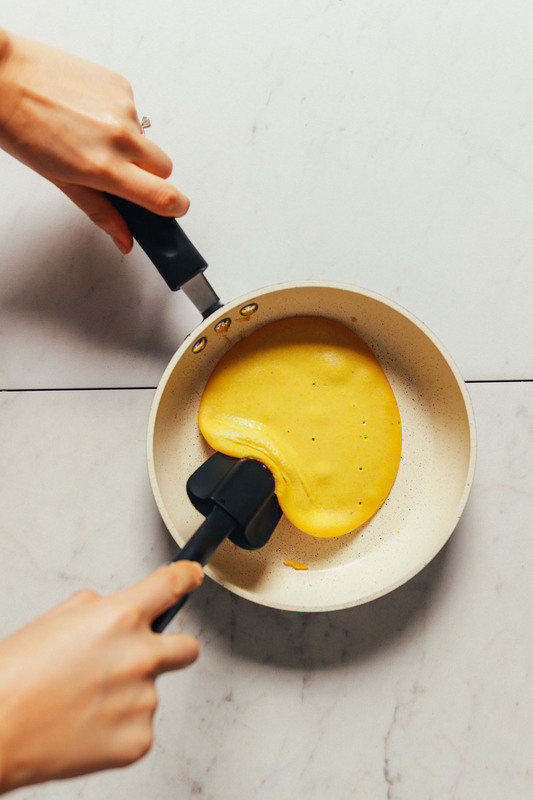 Heat a non-stick pan (we love this one) or a greased skillet over medium-low heat. Once hot, add about 1/4 cup (60 g) egg mixture, or enough to almost reach the edges of the pan. Then cover. Cook for 1-2 minutes, or until the edges appear a little dry. You may notice bubbles on the surface. Then use a rubber spatula to gently push the "eggs" around toward one side of the pan (see photo). Cover again and cook for another 1-2 minutes. At this point you can eat them as “soft scrambled eggs" or continue cooking longer. You can also flip to cook the top side more thoroughly. Transfer egg to a plate and let cool slightly. Taste test cooked egg and adjust flavor of remaining batter as needed, adding more black salt for “eggy” flavor or to hide any flavor of baking powder (we used 1 ¼ tsp black salt total // amount as original recipe is written). Continue process until all of the egg mixture is cooked! Alternatively, store in the refrigerator up to 1 week for use throughout the week. This mixture works great for plain scrambled eggs, but we also suspect sautéing a little onion, garlic, veggies, or greens before adding the egg mixture would work well, too. For more cooking options, see notes! Serve as is, or with desired toppings, such as salsa, vegan parmesan cheese, fresh herbs, or toast. *We tested this recipe with whole mung beans (which are green) and it did not work as well. We recommend moong dal for best results. *Nutrition information is a rough estimate calculated with olive oil and lesser amount of salt. *For an omelet, cook desired veggies then remove from pan. Add the egg mixture and top with cooked veggies. Cover and cook for 2-3 minutes, or until the egg mixture appears cooked through. Then remove lid, carefully fold the omelet in half, and enjoy. For a frittata, cook desired veggies in your pan, then pour on desired amount of egg mixture and transfer to a 350 degree F (176C) oven. Cook until the mixture appears golden brown on top and is slightly firm to the touch. Can I use Mung bean FLOUR with the rice flour instead of raw mung beans? Curious to save some time. Hi Crystal, if the mung bean flour is made from split yellow mung beans, not green, then it might work. Thought we haven’t tried that and cannot guarantee results. Hope that helps! If you give it a try, we would love to hear how it goes! OMG I am SOOOO going to do this SOON! Ordering everything from your amazon link TODAY! Question; Do you think quinoa flour would be ok to use in place of the rice flour? Or do you think it would make a big difference? Hi Crystal, thanks so much! We haven’t tried quinoa flour, but it might work! Rice flour helps give it structure and crisp up a bit and we aren’t sure if quinoa flour will have the same effect. If you give it a try, we would love to hear how it goes! I absolutely love this recipe! The first time I tried it, with just a swipe of oil on my nonstick pan, it stuck. Then I tried it with a hotter pan and more oil, and it didn’t stick! I have a couple of questions. What would you suggest as a substitute flour for the rice flour? I’m concerned about the levels of arsenic in rice flour. Would garbanzo flour work? Or would it be too heavy? And can this be used as a substitute for eggs in recipes? Thanks so much for your brilliance! Hi Rebecca, thanks for the lovely review! We tried it with chickpea flour and didn’t love the flavor, but it does technically work! Other readers have had success with tapioca flour. For substituting in other recipes, it may work for some, but probably not in baking. Stay tuned for future recipes! Hope that helps! Hi Dana, I always love your recipes. Thanks for openly sharing your creations. Pancakes and eggs is the one dish I truly miss since adopting a vegan diet. I cannot wait to try this. Any suggestions for a suitable substitute for rice flour? Hi Trudy, We tried it with chickpea flour and didn’t love the flavor, but it does technically work! Other readers have had success with tapioca flour. Hope that helps! I love all of your recipes, and have eaten almost exclusively from your website this week. What a joyful week of eating it has been, plus I feel great! I have to admit, I was a skeptic about this one, even while cooking (I got impatient and manipulated it while still wet). Then I tasted it, and my mind was blown! My brain really registered scrambled eggs. Thanks for this one! Your recipes are amazing and is basically my entire vegan cookbook! One of the things I really miss since going vegan is eggs. This recipe is amazing and fills this void! My co-op didn’t carry moong dal or black salt. But I found moong dal at a local imported food store, 1/3 the price of Amazon! No black salt, but I was impatient and had been wanting to try this recipe since it was emailed out. So I made it without the black salt, but will order online before I make it again. Thank you for sharing yet another fabulous recipe! So yummy as an omelette, I can’t wait to try it with chillaquiles! Hi there! Really looking forward to trying this as I am also afraid of the just egg ingredients list. Would potato starch work instead of rice flour? And if I happen to not find split mung beans, could I “split” them myself by pulsing in my food processor? Thanks! Hi Lauren, we haven’t tried potato starch, but think it might work! Let us know if you give it a try! For the mung beans, you would need to both hull and split them to make yellow split mung beans, so we don’t think it would work with a food processor. We have tested with whole mung beans and it isn’t the same. The texture does not get as creamy and the scramble is green. I highly recommend split mung beans (moong dal), which are linked to above and can be easily found on Amazon and most grocery stores. Thank you so much! I bought Just Egg once and thought it was pretty amazing, but it’s expensive, plus it comes in a plastic bottle. So being able to make it at home is perfect! My first batch looks & tastes wonderful, but the texture is more like pancake than omelet. Next time I may start with less flour. Or maybe it was the beans. The ones I got at Fubonn were peeled split mung bean (monggo) from Thailand. Question: how much water do you add to regular coconut milk to make light coconut milk? Hi Heather, we aren’t certain, but think that if you added a full can’s worth of water to a can of full-fat coconut milk, it would be about the same as light coconut milk. Hope that helps! This tasted very good, especially mixed with sautéed veggies, but really, to me, did not taste at all like scrambled eggs, more like a savory pancake. Kind of like my favorite garbanzo flour pancakes, but a different flavor that was very nice. I did follow the recipe exactly. All in all, very tasty, and I will use as a savory pancake. Maybe with less rice flour and veggies it might come out like egg foo yong? I’m not sure it really qualifies an egg “substitute”. But then, heck, most vegan foods really don’t taste the same as eggs/dairy. And why worry if they don’t? Plenty good on its own. OMG. This was wonderful. When I went vegan one thing that I really missed was my morning egg, hence my high cholesterol, which I don’t miss. This recipe hit the spot. As I live in a remote community I needed amazon to obtain the necessary ingredients and they came through. Amazon had the split mung beans and the salt. The black salt is a must to give it that eggy flavour. I followed the recipe as outlined and it turned out perfect. One morning I even sautéed some veggies to make it more interesting. Thank you for your wonderful recipes. you are my go to girl. I also have your recipe book which is wonderful as well. Recipe is great and inspiring! Finally have some vegan eggs for scrambling and to use as flax egg sub in my banana muffin recipes etc. Thanks again for all your great recipes! Love the vegan sloppy joes recipe as well! This was awesome! Made this with all the recommended ingredients in both omelette form and scramble form. Curious to see if this would work as the egg component for French toast. Keep up the great work! We wondered the same but haven’t tried it yet! Let us know if you do!! Yet another wonderful recipe! I made a double batch to have enough on hand for the week. I used almond milk instead of coconut and added a bit more rice flour as suggested. It turned out perfect. We made vegan egg sandwiches on English muffins yesterday and vegan omelettes with fresh guacamole and salsa this morning. Dana, you’re a rockstar!! what did the extra rice flour do for you? I only added less than 1/4 cup more to make it a but thicker since I substituted almond milk. I made this but substituted pea protein milk for the coconut milk, and substituted tapioca flour for the rice flour. We loved this! Great flavor. Great texture! Delicious recipe, thank you! Do you have to use light coconut milk? 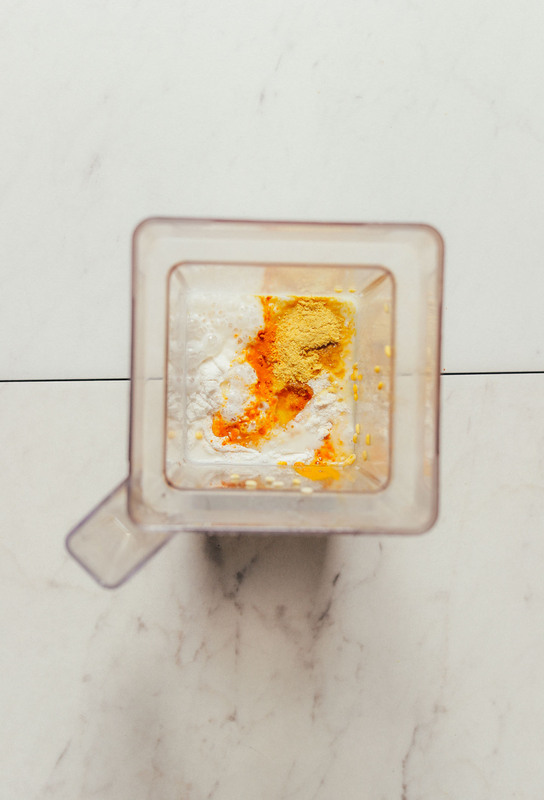 We find it works best with coconut milk (we think it’s due to the higher fat content), but other readers have had success with other non-dairy milks such as almond milk. Hope that helps! You are such a genius for real! Super easy, quick and very tasty! My one year old also loved it! Such a great thing to have on hand for snacks and breakfast! Thanks so much! There was a very dry raw bean like flavor. Next time I’m going to try to cook the beans for a little bit before blending. I did soak them 10 hours and rinsed after. Did you attempt to boil the Mung beans ? Did you use moong dal (split mung beans), or whole mung beans? That might’ve been the problem. And to answer your question, no we haven’t tried boiling them. Loved it, I’m always looking for ways to improve my protein intake and wow omins at the same time! Had it scrambled on toast with brown sauce. Big hit with everyone, the only comment was that it tasted a bit coconutty! Oh, and I omitted the black salt as can’t stand anything eggy! Thank you! Just made this for breakfast. The texture is more doughy than I had expected, but otherwise a satisfying substitute! I might reduce the flour a little bit, and only add 1/2 to 2/3 of the black salt, and cut the onion powder in half. It was very tasty, but oddly enough almost toooo tasty. What I loved about scramble eggs was the bland saltiness of them (am I the only one? Lol). A more wet, lighter, and less savoury batter will be attempted next time but again, totally hit the spot!! Can’t wait to try this! Accidentally picked up some moong dal while shopping for an Indian friend, didn’t know what to do with it but was thrilled when I saw your recipe!!! I’ve wanted to try Just Egg but couldn’t justify the price (ordering online, never seen it in stores near me) and the canola oil. This looks so good! Thank you for sharing! I made this tonight and it was perfect! Followed your recipe as directed. It was tricky getting it to scramble so I tried it both as a savory pancake and an omelet. It is now my favorite omelet and I will definitely be using it loads in the future. It was super easy to make and less finicky than the chickpea omelets I have tried. Thanks for experimenting with this. I agree with some other commenters, love the just egg but don’t like the animal testing behind it or the price tag. I just made this per instructions and it turned out so good! I made it omelet style and had no issue, really easy to make and cook, and it tasted really good. I used a non-stick pan and wiped a tiny bit of oil in it prior to putting batter in. Thank you for experiementing with this one. It really does make the perfect omelet. Lovely! Thanks for sharing, Katherine! So excited to see this recipe! I have been dying to try Just Egg since I first heard about it. However, I have yet to see it in my area. While I have tried the Follow Your Heart Vegan Egg, my preference is still tofu scramble. Happy to see a simple, unprocessed version of a vegan egg! Do you have any tips for cooking this on a gas range? I had great success with the Vegan Egg on my electric stove in a non-stick ceramic pan. My husband and I recently remodeled the kitchen and upgraded to a gas range (yay!). I have only attempted to make the Vegan Egg once since then and, despite using the same cooking methods, it stuck to pan. So this doesn’t really stick to the pan in my experience. A non-stick ceramic pan is great. Or, you can just lightly oil a cast iron and go that route! This recipe looks so delicious! But I was kind of disappointed to hear you knocking canola oil. The source you cited draws support from animal studies (rats, etc.) and highlights that the ratio of omega-6 to omega-3 fatty acids could be inflammatory (i.e., canola oil is perhaps not anti-inflammatory enough on its own, but who gets all the fat in their diet from it anyway? Go walnuts and flax!). Additionally, saturated fatty acids (which coconut oil is rich in) have been demonstrated in human studies to increase inflammatory markers. Just some food for thought. 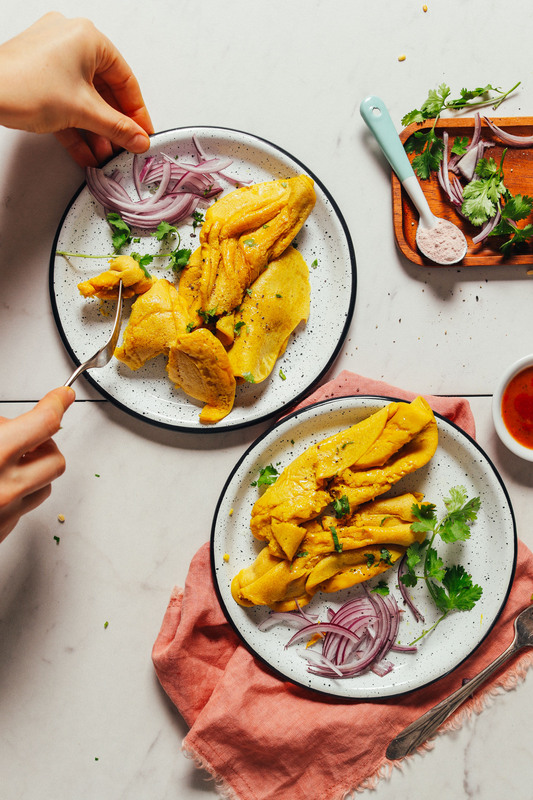 Check out info on the Nordic Diet, which is gaining popularity as another healthy plant-based diet, except in place of the Mediterranean Diet’s olive oil there is canola. Thanks as always for great recipes! I hear you, but I am more concerned about the way canola oil is processed. It’s just a highly processed oil (with chemicals) and how can we be sure that our bodies can digest and process that properly without being inflamed? If it works for you, great! I just prefer not to promote or use it. Coconut, avocado, and olive are my preferred. Great recipe — the Just Egg won’t be in available in Europe till later this year and I was starting to think about experimenting with mung beans myself! Perfect timing :) I used glutinous rice flour, as that’s what I had on hand and a rice/coconut milk combo. The texture is a little more sponge-y/pancakey than eggs, but it hit the right notes — especially with the black salt. My partner came home, sniffed the air, and asked with confusion, “Are you cooking eggs?” So far I’ve had it as prepared in the recipe with more black salt and pepper sprinkled on top. I will try a scramble and an omelette soon! Do you think red lentils could be substituted for the beans? I have all the other ingredients in my pantry. Thank you! We haven’t tried that! but if you do, let us know how it goes. I’m stoked to try this. Quick question: how well does this store/reheat? For making in advance, we prefer to make just the batter ahead of time and then cook just prior to serving. Hope that helps! They should also reheat well, but we haven’t tried that- we would love to hear if you give it a try! I had the same thought! Did you try it with red lentils? I made this today with Toor Dal and forager half and half (it’s all I had on hand!) A+ for fluffyness! I will try again with Moong Dal for sure! 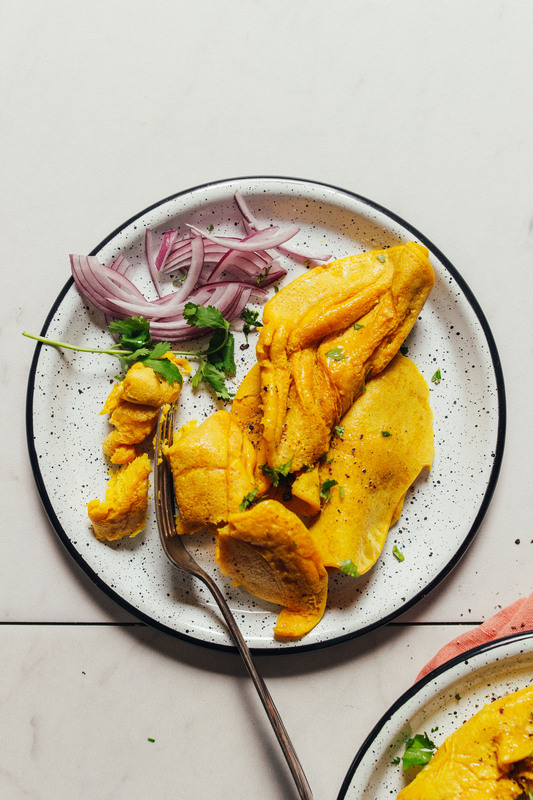 The Toor Dal version reminded me of a chickpea flour scramble (a bit thick), so no sure that’s ideal :) I’m sure you’re sick of eggs but if you could recreate Spero Foods Scramblit as well, that would be amazing. Thank you for the wonderful recipes! You’re a household regular for us. I need help with “nonstick” skillets. No matter what I do, my food sticks. I got rid of the Teflon and got a ceramic pan, but the first time something got burnt that was the end of it. Doesn’t matter how much oil or no oil I use. And my stove is a glass top so apparently using cast iron is not a good option. Help! So, we linked one above and also tried another brand (Stone Earth), but later realized it in fact had teflon. SO, we can’t recommend that brand, and otherwise would recommend the one linked above! Turned out amazing, I’ve been looking for a tasty egg substitute for years- will definitely be added to the daily rotation! Thanks! Hi Dana, this isn’t directly related to this recipe but it’s something I’ve been trying to find more information on. I’ve been seeing a lot of arguments lately centered around the idea that soy isn’t sustainable, because it’s such a huge industry worldwide (soy products are in EVERYTHING, not even just a lot of edible things) and is typically cultivated with heavy use of GMOs. I feel there is some careful consideration to be made before deciding on a black-or-white response (with regard to my own consumption of soy)–for example, the water/pollution footprint of soy might actually be better than other crops when indexed with nutritional/market values (as with almonds). Do you have any resources or knowledge on hand that you think could provide some information on this? I’d really appreciate it if so. If not that’s fine too! I don’t – I’m sorry! I only limit soy because in large quantities it upsets my digestion. But as for sourcing, I always buy organic and non-GMO or even better, locally made. Hope that helps! Wow, this is delicious! I used almond milk instead of coconut milk with no regrets. I also added ground cumin, Indiana chili powder, zaatar, curry powder and black pepper, all in small quantities, to the batter. I sautéed veggies prior then added to daal pancake. Me again, just wanted to mention that I didn’t want to wait 6 hours before trying this recipe. I soaked daal for 1 hour, in water that I had brought up to a boil. Worked perfectly. Thank you again Dana. Another incredible recipe! This is pretty great because I just found out the Just Egg is tested on mice so it’s not vegan (not that they claim to be). I’m happy I can still enjoy something that’s close! I would love to try this, but im allergic to coconut so I was wondering if you tried out any other substitution like almond or soy milk? I’m thinking a creamy, higher fat plant milk would be preferred. Perhaps homemade almond or cashew? Would the batter keep well in the fridge for a few days so it can be cooked in smaller portions daily? Or do you recommend cooking all at once and keeping the ‘egg’ to reheat everyday? Yes! I think the batters keeps well in the fridge for about 1 week, making it perfect for daily scrambles. I’ve been meaning to try something like this ever since I heard of Just Egg … but since my daughters dislike the taste of coconut in anything savory, any idea what to substitute for the coconut milk? Would a vegan “cuisine” aka cooking cream work??? Thank you! Hi Claudia, I’m not familiar with cooking cream. But either that or a creamy, homemade almond or cashew milk would also likely work! I love your recipes. Thank you for this. I was just about to buy the product that you mentioned. It was $11.00!!!! Whoa! That’s high. Hopefully this works as a more approachable, daily substitute. Wow, I became so excited as a have a pack of these mubg bean like for a year in my cupboard.. but then I saw the note that green ones are not correct :D Could you please tell me how bad actually the version with whole mung beans is? Does it worth giving it a try? Thanks in advance! I’ve tested with whole mung beans and it isn’t the same. The texture does not get as creamy and the scramble is green. I highly recommend split mung beans (moong dal), which I link to above and can be easily found on Amazon and most grocery stores. Ok, got the idea. Thanks, Dana! Can’t wait to try this recipe! I have some split yellow peas in my pantry so I might try those. I’ll let ya’ll know how it goes! Happy Cooking! I’m so excited to try this recipe. Since I started eating a plant based, no/low fat diet, I’ve miss eating eggs. I just tried Just Egg, and it was good, but it’s quite pricey. Do you think I can substitute almond milk for the coconut milk (due to the fat in the coconut milk)? Thank you for sharing this recipe. Hi Teri, it really does work best with coconut milk according to our testing (we think it’s due to the higher fat content). But if you give it a try let us know how it goes! I would also like more details on the non-teflon, non-stick pan, please. JJ, we linked one above and also tried another brand (Stone Earth), but later realized it in fact had teflon. SO, we can’t recommend that brand, and otherwise would recommend the one linked above! Could I use coconut flour or GF all purpose flour instead? We haven’t tried that, but if you do let us know! I’d think all purpose flour would be best. Great recipe! I just made it and it is delicious. I did not have rice flour, so I substituted with 60% all purpose white flour and 40% tapioca flour. I’m so excited to try this recipe. Do you know if you can cook the whole recipe all at once like cooking a large amount of scrambled eggs? I have 6 kids so doing it that way would be great time wise. I think that would work great! Just use a large enough pan to accommodate. Maybe a ridiculous question, but – I don’t have moong dall but I have dried Toor Dall – would that work? I’m not sure! But if you give it a try let us know! I could envision this being an omelet. It doesn’t look like the texture or visual of scrambled eggs to me and both are important to me when eating. But I could see this folded with beautifully sauteed, garlicky veggies inside. After someone referenced the Indian dish, I looked it up and that’s almost exactly what it looks like. Could you use full fat coconut milk instead of light ? 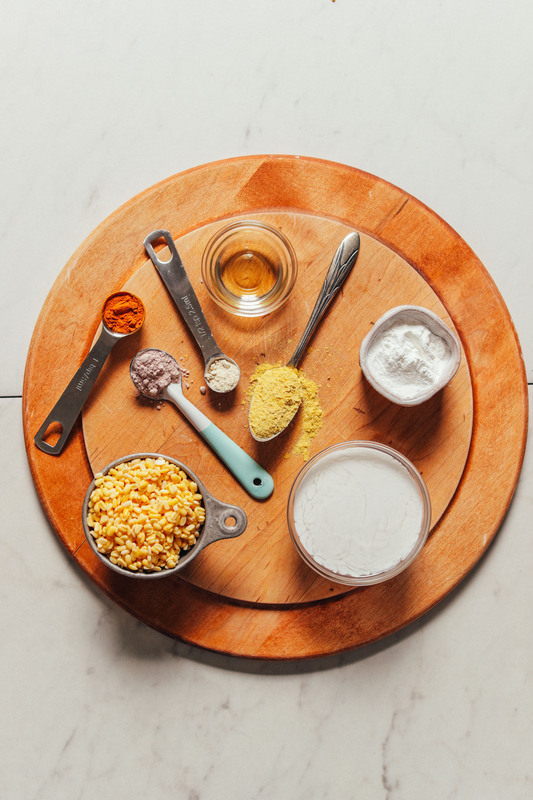 have you tried making a quiche with this mixture yet? i’ve really been wanting one lately! What a fabulous idea! Ingenious, really! Reminds me so much of moong dal dosa, but I would never have thought of this! Wow! Thank you! I will be sure to try this out and rate the recipe! I just made it and it is fabulous and so easy, Dana! Thank you! Looking forward to your take on a dosa – there are so many different kinds (including the ‘chilla’ someone mentioned here). By the way: I, for one, appreciate and have noticed your crediting native dishes and stating where your inspiration comes from. So thank you for that and for all of your wonderful, inspiring recipes! Did you try chickpea flour as a thickener/binder instead of rice flour? I know a lot of vegan omelettes include it. That would work, just know that it will affect the texture (less creamy) and the flavor. We tried it with chickpea flour and didn’t love the flavor. But it does technically work! Let us know how it goes! Is there a way to do this without rice flour? Or what might happen if I just omit it altogether? I think it would work! Rice flour helps give it structure and crisp up a bit. Let us know how it goes! ^^ Whoops, meant to post that on the Moong dal chilla comment! I tried it with friends with and without Brown Rice Flour. The only difference was the thickness or fluffiness, but the texture still felt similar. As for the rest, the flavors were a lot stronger (because they were more condensed I assume) in the recipe w/out BRF. Both were amazing. Highly recommend this recipe. Also, do you know the shelf life of the mix – if I don’t cook all of it the same day? Thank you! This is literally an Indian dish called “moong dal chilla.” Except that’s made thinner than this, and well done. It’s often eaten as breakfast, or as a snack; served with ketchup and coriander chutney, often topped with lightly caramelised onions. SMH calling it “scrambled eggs.” It pains me to see so many MB recipes these days appropriating from Indian food, without giving credit where it’s due (even just stating the inspiration would do). How interesting! I had no knowledge that this was an Indian dish, or that it was called moong dal chilla. Therefore I wouldn’t be able to state it as “inspiration.” However, thanks for letting us know. I genuinely do try and be careful about giving credit to native dishes, and stating where inspiration comes whenever possible. Unfortunately that’s not true. Do like your recipes but have seen much food culture appropriation on this site. I agree with Avni above. It’s weird that the key ingredients you list are all Indian (and the top two are also plain Hindi words), yet you didn’t think to check if this was already a dish. Also, I think you should do a better job moderating comments. Martin’s comment below dissing on Avni’s calling out cultural appropriation makes it seem like you endorse his hateful views. I find this comment unnecessarily harsh! I think it would be listed as inspiration *if it was the inspiration*. Obviously, if someone has never had this dish, they wouldn’t know! Especially as the MB recipes are often credited back to sources of inspiration. I think this looks great. I googled moong dal chilla, and it also looks great. I think I will try both! So… you are one of those cringy ppl crying with the “cultural appropriation” meme??? MB is one of the best vegan websites, PERIOD. Technically, this is not cheela. Cheela does not use onion powder, nutritional yeast, or coconut milk. A reference to cheela is not mandatory. MB has already made references to moong dal and kala namak, both of which are Indian ingredients, so to your point about stating the inspiration – I believe this has been achieved. This is also not brand new stuff. Vegan Richa already has a similar recipe from many years ago. Its not necessarily a cheela appropriation but if it was inspired by some process that was seen somewhere, then it would be nice to have that mentioned. On a positive note, the texture looks great! I love that nonstick pan! Where did you get it?